Christmas is considered as the biggest celebration in all over the world not only for the Christian religion but also for all the people in all nations. People like to get gifts in this celebration from their near and dear relatives. They like it most when the gifts are made by hand by their dearest persons. As men are the social being, they like to make each other happy. Homemade Christmas gift is a very popular and creative way to make your persons happy and make their Christmas more enjoyable than any time before. For buying Christmas gift, people use to make the crowd in the mall for shopping. But this is so old fashioned. If you just try by your heart you can make your dear peoples happy. Homemade gifts are not only cheap and creative but also unique in their way. Homemade gifts carry lost of memory and happiness with so much love and care. If you ask me, I will mark homemade Christmas gift as the best gift for Christmas. If you just make your plan and give your love and affection for making this gift, it’ll be the best gift to the person he or she will have ever got. -I can help you with your creative ideas for homemade Christmas gift. Now I’ll give you some gift ideas and their making recipes which are perfect for Homemade Christmas gift. The list of the homemade Christmas gift ideas and recipes is as follows. It’s just a trick to make new best gift for Christmas with some product that are available near your hands. You just need to cut one piece of webbing at the same length of the holders and trim it a bit shorter that the heights of the holder. With Mod Podgy coat the webbing raw and dry it. You can also affix the webbing around the holder using thin lines of glue. Make few and package it with candles of the same size. This idea works like some tonic that is really effective for an Occasion like Christmas. It is the clever project and you will love it. Print some photos of your and the persons you want to gift. The size of the pictures has to remain under passport size. By using cards, you can make a little toy card and place the photos over it. You can also write something behind the photos and make it more interesting and put all those photos on a Photo Frame and give a gift to him. 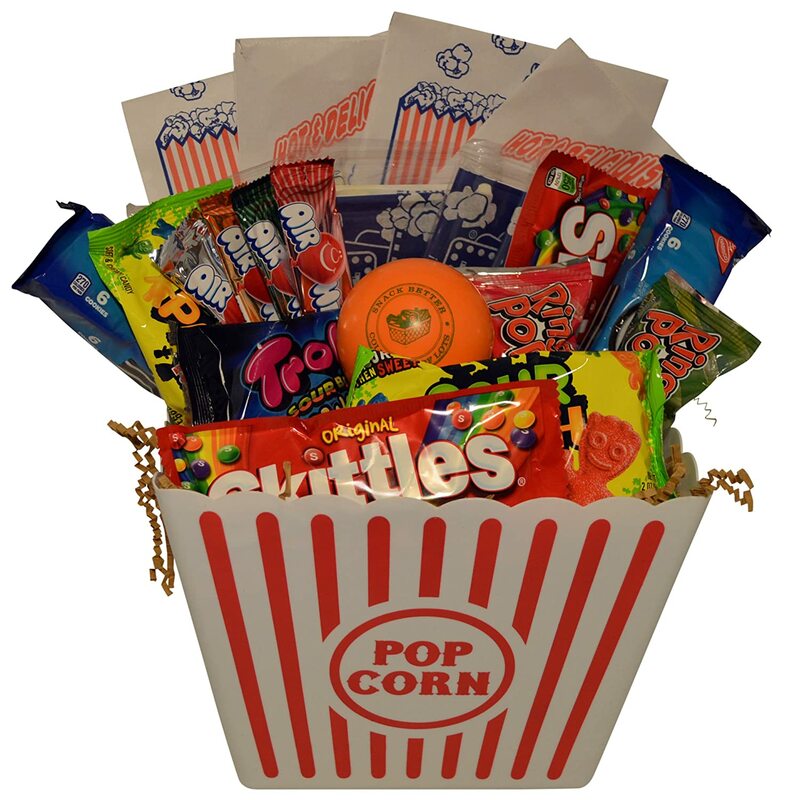 Ultimate Movie Night Gift Bundle Care Package, Easter Basket, Christmas Present with Popcorn, Candy, Cookies Plus Snack Better Stress Ball for Entire Family! You should have an idea about the person’s favorite movies or albums or desired copy of some classing album. You can just buy some microwave popcorn and two boxes of movie candy with their favorite drink and package it with their favorite classic movies or albums. The person will love it. Generally, Christmas comes at winter season. Naturally Christmas cannot have their beauty without winter. So you can give a basket of winter warmth to your favorite person. This gift of the basket can include a coffee mug, a pair of puffy socks and decorate it as you want. Who doesn’t love chocolate? Winter is the perfect for chocolate and Christmas is seemed incomplete without chocolate. You can make same some chocolate dessert and serve it fresh to your dearest one. The person won’t be disheartened. Beer is the only thing that can cheer anybody up from the freezing temperature in winter at the time of Christmas. People drink factory made beer but if you want you can also make Beer at home and surprise your nearest people buy offering it lightly. This item can be considered as the best homemade gift for your sister, mother or wife in Christmas. If you know how to sew you can fulfill your dream by giving them, you own handmade hat or scarf in the Christmas. Everybody uses a card or stationary products to wish people for the Christmas. You can be different if you think in a creative way by using both of the things. You can make your wishing card by yourself and attach some stationary products with it. This can be a nice package for homemade Christmas gift. Christmas is not Christmas in a home if there is no Christmas tree. People love to decorate it with various lighting and color and keep it in their drawing room. You can make a Christmas tree and decorate it creatively using bubbles, angles, fairies, reindeer etc then gift it to your relatives. -I hope that you have understood the ideas written here and you will apply this on upcoming Christmas.